Planting my first indoor garden! It is no secret that I wish I had my own garden. And I really can’t wait to have one some day. I do know a garden needs work and care, for it to grow anything successfully, but I just love the idea of growing your own food. The joy all the hard work brings in rows of lettuce and other greens, small colorful peppers and that moment when you pull out your very own carrots from the ground; those moments when you can just grab a basket and go to the garden to pick things for lunch or dinner. At the moment I live in an apartment without a balcony, and while I’m very happy with my living situation, a garden is the one thing I can’t have right now. I could find some land to rent, but I don’t think that’s practical or economical for a gardening beginner. But this year I’m not letting any of this stop me. 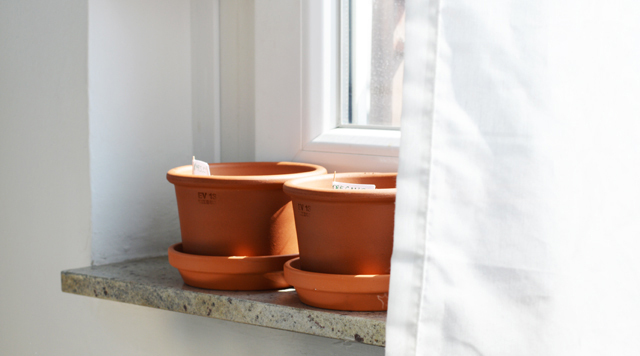 I decided to create a small indoor garden, a row of pots on the windowsill. I am growing mainly herbs. I’ve bought basil plants before, but they never seem to survive. I’m doing everything myself this time, starting with the seeds and hopefully in a few months I’ll be able to say “You know, I grew the basil used in this recipe all by myself!” Doesn’t that sounds nice? I don’t have any big goals, I just hope to have success with at least one plant out of all I’ve planted. And hopefully learn a whole lot by next year. I will share an update once a month and hopefully inspire some of you to follow along. The good thing about indoor gardening is that the temperatures are always warm enough for the plants and so I hope some herbs make it through the winter. Since this is nothing revolutionary, it’s very possible some of you already have your mini indoor garden. If so, please feel free to share any advice or experience in the comments, I’d be happy to read all about it. Since this is an indoor garden, I could’ve planted all the seeds back in March. I was a little late, I admit, and I planted them all in the first weekend of April, which was 15 days ago. Basil likes the sun and moist, well drained soil. Pinch off the center shoot of the basil plant after it has grown for 6 weeks to force side growth and prevent early flowering. If flower stalks do develop, cut them off. Mulch is recommended in hot areas since basil likes a steady moisture supply. Basil is at its most pungent when fresh. The best time to harvest is just as the plant starts to bud, well before flowers bloom. Snip leaves or branches at this time and pinch off flower buds to keep the plant productive. You also can cut the entire plant about 15 to 20 cm (6 to 8 inches) above ground, leaving at least one node with two young shoots intact. The plant should produce a second but smaller harvest several weeks later. Since the leaves lose some of their flavor when dried, freezing is the best method for winter storage. To quick-freeze basil, dry whole sprigs and pack them in plastic bags with the air pressed out. Seeds are slow to germinate. Plants do well in sun or partial shade, and prefer a rich, moist soil. Water regularly, especially in the summer. To harvest, cut entire leaves from the outer portion of the plant as you need them. To keep fresh parsley for as long as possible, store it in the refrigerator with the leaf stalks in water. To dry parsley, cut the plant at soil level and hang it in a shady, warm, well-ventilated area. Choose a site in full sun to part shade and moist soil. Grow the plant in its own container as it’s very evasive and will take over and steal space from other plants. Water regularly to keep soil evenly moist, keep leaves clean. Needs sun and rich soil. Trim back before flowering (approximately 5 to 6 weeks after planting) to stimulate a denser, bushier growth habit. Harvest leaves as you need them; the optimal flavor period is just before flowers bloom. Leaves dry easily and store well; they can be frozen, too. This is the biggest experiment of the bunch because I feel tomatoes are hard to grow indoors. I bought a variety that can be planted in a greenhouse, so hopefully I manage to grow something. Tomatoes need a lot of sun and well-drained soil. In very hot climates, light afternoon shade may help prevent blossom drop. 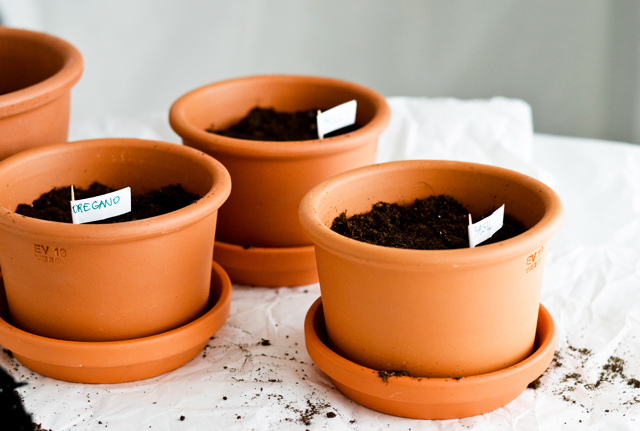 Germinate seeds in a small pot with starter mix. Germination should occur in 5 to l0 days. Provide an even supply of water all season. If staking or trellising, prune suckers to allow one or two central stems to grow on staked plants, two or three central stems for trellis systems. Apply a thick layer of organic mulch 4 or 5 weeks after transplanting. For best flavor, harvest tomatoes when they are firm and fully colored. Fruits will continue to ripen if you pick them when they are half-ripe, but the flavor is often better if you allow fruits to ripen on the vine. 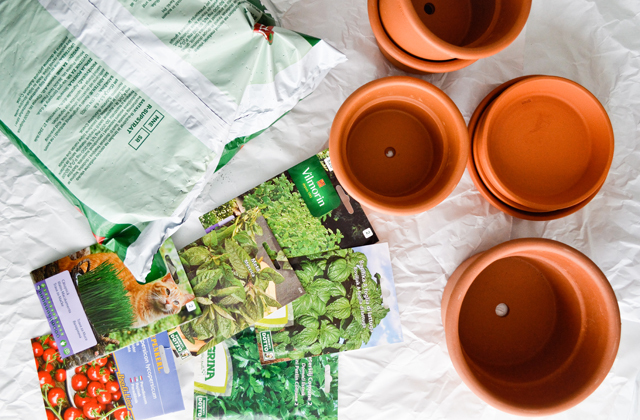 For a continuous winter supply, start one or two new plants from seed every two weeks. Because cats need their greens too. This is the fun part of the garden and I’ll share photos of it, but cat grass is very easy to grow, so I won’t be sharing specific instructions for this. 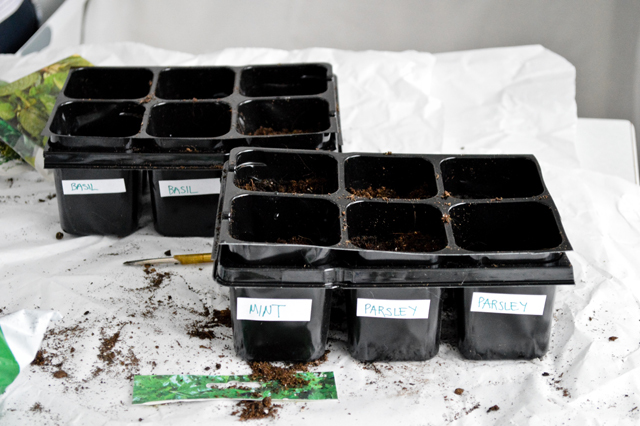 I am growing some plants right in the pots and starting some seeds in the seeding tray. I will transplant the seedlings from the trays after about a month and a half of growth. I will let the plants in the pots grow in there and will only transplant them if needed. 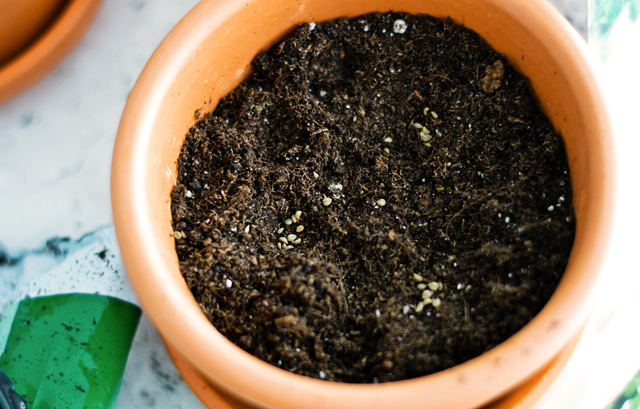 Whether you’re using a seeding tray or a small pot, pack it well with soil. Fresh soil is very light and fluffy so you want to really press it in, so that the seeds you plant won’t sink to the bottom. Leave about 2.5 cm (1 inch) of room under the edge of the pot. Water the soil so it’s moist and ready for the seeds. I decided for the overseeding method. This means you plant more seeds than needed, in case some don’t germinate or sink to the bottom. This way you have a better chance of successfully growing some plants. Most seed packets give instructions on how to plant the seeds, usually 0,5 cm (almost 1/4 inch) deep. This is very shallow, so don’t bury the seeds, just scatter them across the soil and cover them with some new soil, so they are not fully exposed. Clearly label each tray/pot, so you’ll know what you planted. As the soil is already watered and moist, you don’t need to do anything else. Before the seeds germinate, they don’t need a lot of light, just warmth. 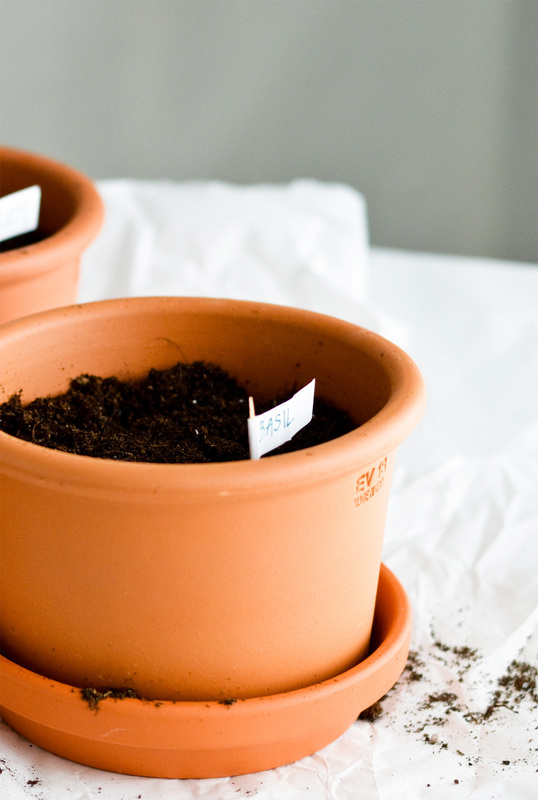 Once the seeds germinate, make sure they get at least 8 hours of sunlight a day. Water when needed. I water lightly every day, sometimes every 2 days, it all depends on the plant. The general rule is that if the soil is moist (dark in color) you don’t have to water, if it’s dry (light brown in color) water lightly. Rotate the pots daily, so that the plants get light from each side. I don’t have any books at the moment and if/when I buy some I will share the information. Garden.org has great plant care guides, which give you general information on a big variety for plants and I cited the general information from here. I also found these two informative YouTube channels, both created by Gary Pilarchik: The Rusted Garden and New Gardener with videos that are very informative and have clear directions, so I definitely recommend them. How lovely! You have more than me planted but I’ve been trying to take it slow- I kind of have a black thumb. So far I’ve been having luck with the herbs in my windowsill though! Best of luck!